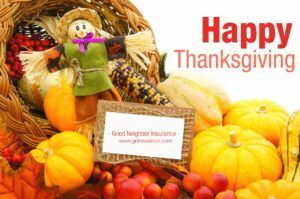 I am very thankful for a good team of co-workers at Good Neighbor Insurance (GNI). I am thankful for a wonderful wife and good home and many friends. 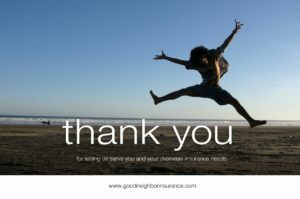 The opportunity to serve faith based clients through my work at Good Neighbor Insurance. I enjoy helping them. Having two great kids who grown up to be fine adults. I’m thankful for my new home. I’m thankful for my board-gaming group. For not fighting traffic on the highway to get to work. For having vacation days so I can visit my children and spend some of my hard earned pay. Thankful for the simple pleasures of riding a bike to work. I am thankful for the fall rains we’ve had. The resulting desert wildflowers in March will be spectacular. I am thankful that I can see so many colors. How boring this world would be if we could see it only in black, white, and shades of grays. I am thankful for the sound of children laughing which always lifts my spirits. I am grateful to God for the life I enjoy: For freedom of conscience, freedom from living with regret, opportunities I’ve had, my health, friends, an amazing wonderful family, some of this is due to being born in America, some of this is due to choosing to allow God to set me straight and lead me on a much better course than I could ever pick for myself, and some due to providence/opportunities to meet my wife when I did, etc. I am grateful for the ability to work. At a place where I can use 1.) My talents and gifts, 2.) My passion, and 3.) My ability to earn a living wage and feed the family. The wisest man in the world once said, “To enjoy your work, to enjoy your food, to enjoy your family, this is a gift of God.” In a world where so many are happy to simply have a job (whether it allows them to use their gifts and talents or not), I realize that I am extremely fortunate to be at Good Neighbor and serving some of the most amazing, well-traveled, and compassionate people I’ve ever met. I’m grateful for the new president of Indonesia. He seems to be very different from typical Indonesian politicians. If he can endure the upcoming 5 years of being attacked by his opponents, then Indonesia will have a much brighter future. I’m thankful for a job that is flexible enough for me to work from home, and useful enough to spread the Kingdom of God in the nation of Indonesia. I am thankful that one of the items on my wish list has been accomplished. I am thankful for the best team, that I have in Indonesia. I am thankful for the opportunity that God gave to me, so I can go to college. I am thankful for my new niece. I am thankful that I finally graduated from university. I am thankful for my new room in the office .